The American Trucking Association reported earlier today a decrease in the seasonally adjusted for-hire truck tonnage index for April 2017, seeing a drop of 2.5% last month. 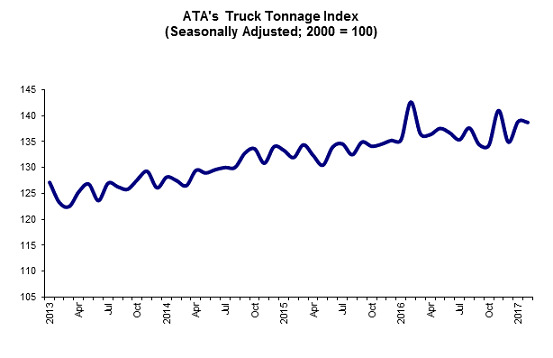 ATA reports that the drop in the tonnage index in April follows a 1.1% decline in March. According to the ATA, the trucking industry provides a barometer of sorts for the overall U.S. Economy, accounting for 70.1% of tonnage carried by all modes of domestic freight in the country. "I have to admit that April's contraction is a bit surprising, especially considering the anecdotal reports I've been hearing from fleets regarding freight levels," said Bob Costello, ATA Chief Economist. "It's not necessarily that tonnage levels fell in April that is surprising, but the size of the decrease. One explanation is that housing starts fell substantially in April as well, and residential construction generates heavier truck freight. Costello said that the reports he heard from trucking companies provided generally positive outlooks on the industry and an upwards trend in regards to freight. "Despite the fact that tonnage is down a total of 3.6% over the last three months, I still expect moderate growth going forward as key sectors of the economy continue to improve slowly," said Costello. According to the ATA, the tonnage index is calculated based on surveys conducted through those who are members with the Association. The ATA reports that the April percentage is a preliminary figure and may change in the final report that is issued later on.